If you're in need of some inspiration and motivation you're going find it right here and right now. On episode 10 of Rebel Boss Ladies we have Camille Attell from More than a Wheelin' to share her journey from a 20+ year career in corporate America to living in an RV full time with a travel blog. Camille's story is incredibly inspiring. She and her husband ditched their house, solid jobs, good income, the “American Dream”, to make a big change in their lives. This transition was super risky and more than a little scary. But they went for it anyway because that's what felt right to them. Today, Camille is going to share her story, how she financed her life during that time with remote work, freelancing and blogging, and how that ultimately transitioned into a business that relies on digital product sales. Today, Camille lives in a 32-foot RV with her husband Bryce and her cat. In a little over two years, she’s travelled across the country, she’s visited about 32 states and covered 28000 miles. 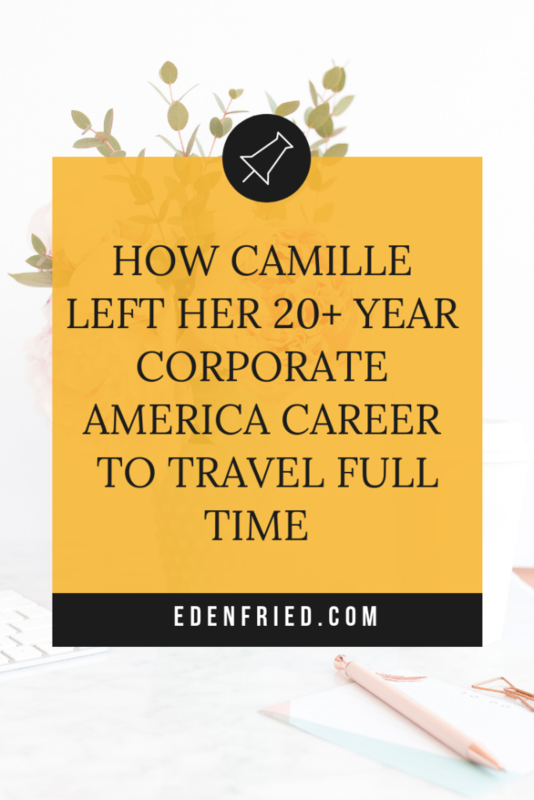 Her location-independent lifestyle began a little over two years ago, when Camille chose to leave the corporate America job she had worked at for almost 11 years. In the back of her mind Camille always had a desire to do something different, but it was easier to follow the “safe route” – working for someone else, getting a paycheck, and feeling secure. She and her husband bought a house, but things just kept going wrong, and they started to feel unhappy about the direction their lives were headed in. Camille recalls discussing with her husband, “it’s now or never. If we’re going to go figure out something else, we’ve got to do it now while we still have a little bit of time to make a mistake.” Her husband was on the same page, and they decided together to completely change their lives. Leaving ‘The American Dream' for an RV! Transitioning to life on the road wasn’t easy. Camille and her husband had to pull themselves out of their ties to their previous life – the home they had bought, their jobs, their family. Camille’s family and friends weren’t thrilled with her new plan. After living near her family her entire life, they had to get used to not seeing her as much. Her friends were worried about her giving up the “American Dream” – after owning a home and working in a steady corporate job for years, Camille’s decision to work for herself was surprising. Not only did Camille have to transition to a new style of work, she also needed to transition to living in an RV. “We actually created a project plan called the Wanderlust Transition Plan… it literally shows you all the steps we took to make that transition.” The plan went through all of the steps to transition to the RV lifestyle, including looking for jobs, finding health insurance, and buying an RV. After hearing some recommendations from others, Camille started her blog More than a Wheelin’. She realized that monetizing her blog would take a lot of time and effort until it became really successful. Camille also pursued freelance work through her previous connections. “I come from the world of corporate training… I networked in my own community and I picked up a lot of work that way.” She used the skills she had learned in her corporate career to find consulting and training opportunities. A big part of Camille’s financial freedom was her changing lifestyle and the different expenses she no longer had after moving to the road. Even though she had a smaller income, she also had a lot less to spend in her new life. She and her husband were able to assess their needs and chose to spend their money on the things that were most important to them. From 2016 to today, Camille’s work and sources of income have changed a lot. She still blogs and gets a passive income from the affiliate links on her website, but she no longer freelances. After a few months blogging, Camille instead chose to focus her time on building her own product, which she knew early on was the direction she wanted to move in. Now, her main source of income is her digital product, Remote Work 101: Work, Live and Travel Where You Want. “It’s a combination of my experience going through this but I also have a background in career development… with my corporate training I’ve been able to leverage all of that to create this program.” She also used the questions that her followers had previously asked her to build her product. Despite all of her varied previous experience, Camille did have to do some research to learn about the best ways to create and market her product. She emphasizes that her course isn’t for people who want to build an online business. While her course isn’t about branding yourself or building your own agency, the course covers a lot, from skill assessment to career skills. These skills, however, could help you transition to building a business down the line, or working towards that ultimate goal. Camille started by launching a “messy” version of her digital product, to gauge interest and get feedback about what she hoped to build. “That way I didn’t invest tons of time and money in something that I didn’t know if people would actually want or buy.” Testing this first iteration of her product was a great way to affirm she was on the right track. The second iteration of Camille’s product began with a pre-sale, where she sold the product before actually creating it. She reached out to everyone on her email list and offered a lower price to encourage sales. It also let her get feedback from her customers through out the creation of the product. A pre-sale is when you sell the product before you actually create it. This allows you to ensure that your audience is interested before you spend all your time and resources creating something. These different iterations of her product really helped Camille to figure out and “lock down” what she wanted to create. Since then, she hasn’t had to do much to sell her product. Her affiliate sales and email lists have worked really well during her product launches, but she does hope to build her marketing strategy in 2019 by buying ads and reaching different audiences. Use Your Email List to Sell! Camille says the success of her digital product was helped by the strong relationship we had with her audience. Her advice: “it’s so important to have a relationship with the people who are willing to give you their email addresses… I really need to invest in that relationship.” She recommends that you should think about email as making friends, and building a more personal relationship. Visit Camille’s website, More than a Wheelin’, here.